May Day Bank Holiday – the promise of a wet weekend on the latest ride to take the two books up north to Bradford. A quick scan of Wikipedia tells me that the city lies at the junction of three valleys which explains why my mate Dave in work (who hails from this hallowed ville) related tales of city centre flooding when ‘e wer’ a lad and couldn’t understand why the recent regeneration of the city centre is focussed on a large water feature. In his day, all you had to do was wait for a drop of rain… So there you have it: Interesting fact about Bradford No.1. Friday afternoon and a grey processional run up the A1 followed by a horrid slog through a mega traffic jam on the M62. Just as I arrived in Bradford the clouds parted, spilling crepuscular rays and a promise of heaven. The road descended to the meeting of the valleys for a quick orientation ride round the centre that revealed a delightful collection of beautiful gold stone buildings. Saturday morning; 09:30am and I’m back in Bradford city centre hopelessly lost with Satnag trying to direct me the wrong way up one-way streets and no sign of the Waterstones store I’m supposed to be signing in. Turns out I can’t see the thing for looking at it. Three times I ride past a huge gothic building never suspecting it hosts the bookstore within. Eventually I stop and wander up a pedestrianized precinct and spy the hallowed ‘W’ over the door round the back. I ride slowly up the precinct and come to halt outside the huge glass-fronted store. I’m greeted by the smiles of Umar the manager who bids me enter with the bike. 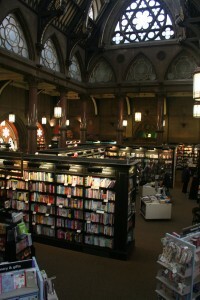 Inside; well I have just entered what most surely rank as the most magnificent bookstore in the world for, you see, Waterstones in Bradford is located in the old Wool Exchange building and is truly a sight to behold. 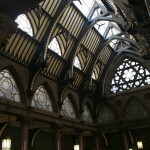 Built in the 1860’s, this grand hall was the place where Bradford’s wool barons came to ply their trade for the next hundred years. The style is supposedly ‘Venetian Gothic’ with a lofty hammer-beam roof lit that spills light through a row of Star-of-David framed windows. 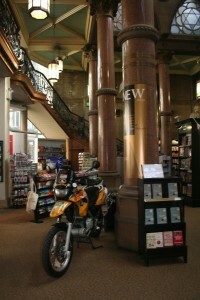 An original mezzanine floor is host to a Starbucks coffee shop affording grand views over the entire bookstore. The upperworks are bolstered with polished granite columns and the overall effect is that of a little cathedral, a place of reverence and tranquility and I can think of no better environment in which to trade books. Beams of light twinkle with dust-motes, perhaps particles of magic emanating from the bookshelves down below. As always it’s not about the quantity on these occasions (I’m back on about the book-selling now) but quality and we were blessed with a number of delightful encounters today including young Ali who is planning an African overland trip with his uncle in a Toyota Landcruiser. Interesting fact about Bradford No.3: In 2011 Bradford was crowned “Curry Capital of Britain” after seeing off wannabe contenders such as Leicester, Birmingham, Manchester and Glasgow. We can now personally vouch that this fact is true having sampled some astounding Kashmiri food at the Aagrah restaurant on Saltaire Road where I demolished a rather unusual lamb and turnip curry, served with a local variation on a Peshwari Naan bread made with pineapple and pistachio nuts, whilst Maggie woofed a delectable veggie dopiaza. Glad to say that the horrible wet weather we’ve been suffering over the last lot of weeks gave up on the Sunday to permit a cracking ride home through the Peak District. My early morning jaunt took me down through Brighouse and Huddersfield and on to Holmfirth and Glossop, a journey made all the more delightful by the fact that this entire area was virgin ground for me and definitely a place I want to revisit. The rain gorged cobwebs of the past few weeks were well and truly blown away by an afternoon’s immersion in the Peaks and the juicy joys of motorcycling once again flowed through my veins. Interesting fact about Bradford No.4: Bradford is the 399th most popular name in USA. One in every 2,071 Americans carries the appellation therefore that makes a total of 151,875 people named Bradford in the USA and apparently that number is increasing by 1,269 people every year. This hopefully useful, entertaining and totally unrelated termination to this blog is brought to you courtesy of www.pokemyname.com! Next stop… BMF ; Peterborough ; freezing rain?? ?